Being an upper elementary school teacher, many of us assume that by the time students get to us, they have been taught plenty of strategies to decode the meaning of unknown words. So why are they still constantly asking what a word means as they read unfamiliar words? This is probably due to that fact that in previous years they were mainly taught to use pictures and context clues to figure out a words meaning. Although these are fantastic strategies to use, in the upper grades, students need to be armed with more techniques as text and words get more complex. So how can we do this? As discussed in a previous post (which you can find here), regularly implementing root words and their meanings into the curriculum is extremely beneficial for students. Since we know it's impossible to teach students every word in the English language, exposing them to root words allows them to unlock the meaning of many unknown words they would otherwise not be able to access. Fun Fact: Did you know that exposing students to just one root word can help them unlock over 20 words? Yup! Talk about getting a bang for your buck! Along with gaining knowledge on root words, learning prefixes and suffixes is also extremely helpful. These groups of letters may be small, but they have a big impact on a word. 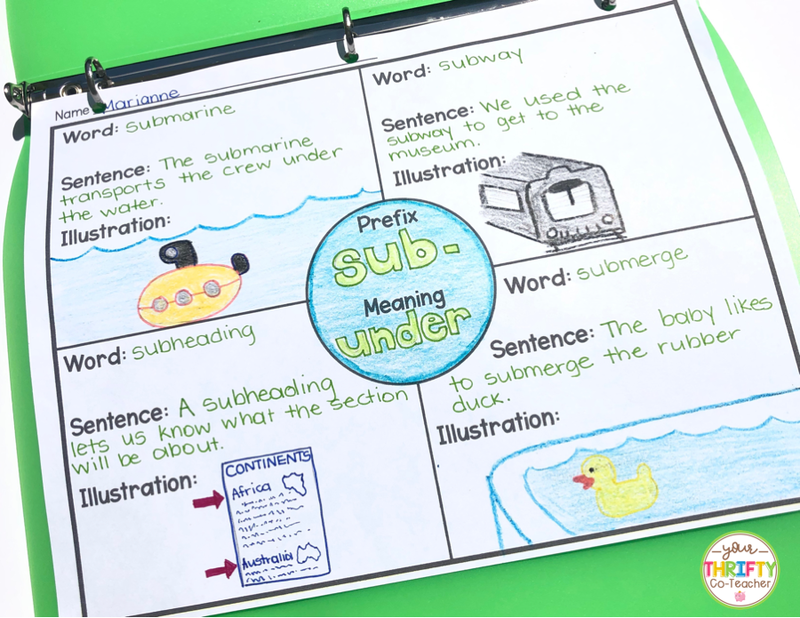 Just adding a prefix or suffix to a word can completely change its meaning, and knowing them can help students unlock the meaning of unknown words. 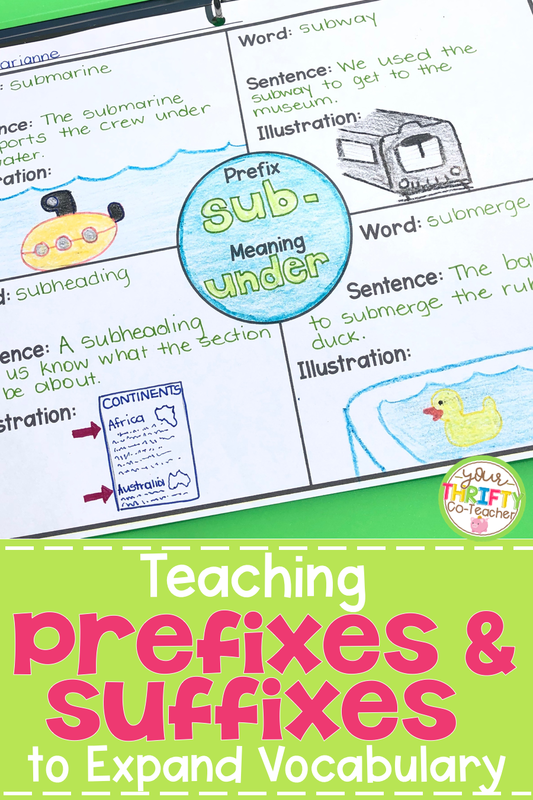 To engage your students when introducing prefixes and suffixes, you can start off with a video. It's sure to get them moving and singing, and HEY, what kid doesn't like that? I'm linking up two videos you can use down below. The first video is great for 2-3 grade and ELL or ESE students who are just being introduced to prefixes and suffixes for the first time. The second video, is a fun way to reintroduce the lesson to 4th and 5th graders. It explains what prefixes are and gives several examples in the form of a rap song. 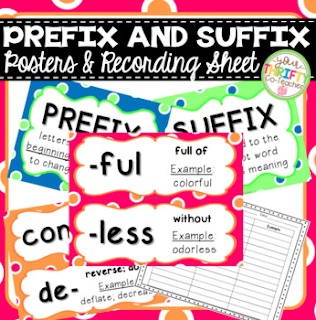 Next, you'll want to expose your students to a variety of Greek and Latin prefixes and suffixes. How you choose to do this is up to you. You can spread them out by introducing a new affix each week, a few of them a day, or all in one shot, Boot Camp style. Because many prefixes overlap in meaning, and so do many suffixes, I usually introduce all the prefixes in one day, and all the suffixes on another day by projecting them on the board one at a time. Students write them down on a chart I provide them with and then keep it in their reading journal. The resource I use is linked below. You can check it out by clicking on the image. As discussed in the root words post, according to Robert J. Marzano and Julia A. Simms of Vocabulary for the Common Core, students should have multiple interactions with a word (in this case affixes) in order to master it. This includes, but is not limited to, being able to provide a description of the word, give an example, and construct a picture or symbol of it. 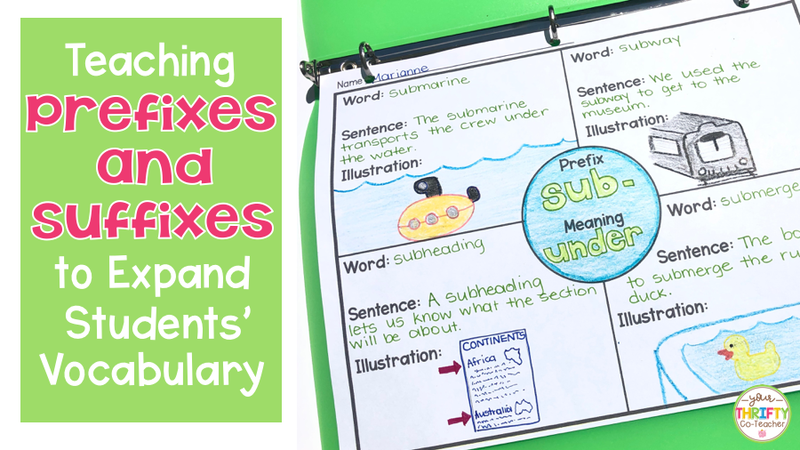 In order to provide them with multiple opportunities to interact with the prefix or suffix, you can provide them with a graphic organizer such as the one pictured below. In this type of organizer, students write the affix and its meaning in the middle, then provide four examples of the affix in a word supported by an illustration and it being used in a sentence. Students can work on these independently, with a partner, or in small groups referring to an online dictionary when needed. If you'd like this graphic organizer to be sent to your inbox for FREE, just fill out the form below and it will be on its way. Please Send the Affixes Graphic Organizer My Way!!! Do you like implementing classroom transformations? 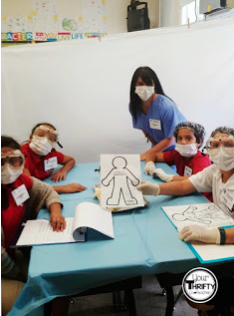 If so, click HERE to read about the Surgery Room Transformation I created to help my students implement all the knowledge they had gained about root words and affixes. Now it's your turn, my Co-Teacher. 😉 I'd love to hear what techniques you use to teach your students about prefixes and suffixes. Be sure to share below! ...and remember to come back soon as we will discuss the advantages of teaching students to identify context clues as we continue our Vocabulary Acquisition series.